Hallowe’en is just around the corner, and if you’re like us, you want to snuggle up with a good scary movie and some sweets (ankh-cookies anyone?) in honour of this favourite Fall holiday. The Nile Scribes have a film recommendation for those of you Egyptophiles who prefer mummies and Egyptian deities over witches and vampires. But be warned! These Egyptian gods are a little more blood-curdling than we’re used to! If you’re looking for a creepy and spooktacular Egypt-themed film to watch this weekend, let us introduce you to The Pyramid (December 5, 2014). The Pyramid is a partially found-footage horror film set in Egypt during 2013 (supposedly shortly after the removal of President Mohamed Morsi). A team of American archaeologists, including a father-daughter duo played by Denis O’Hare and Ashley Hinshaw, have discovered a new pyramid in Egypt. Their aim had been to rediscover the “lost pyramid of Akhenaten,” apparently described in some ‘ancient texts’. The team was ultimately rewarded with the discovery of a complete and unique three-sided pyramid (or tetrahedron) long buried in the sands. 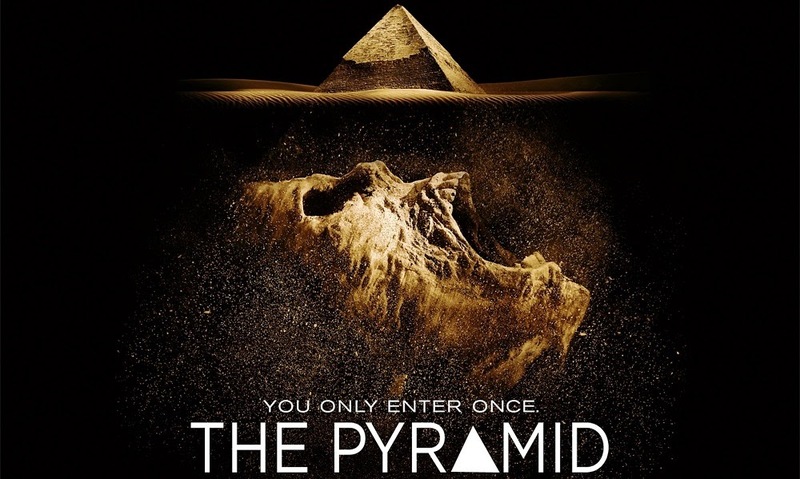 The pyramid, in true horror form, turns out to conceal a labyrinth, from which our intrepid archaeologists seek to escape for the remainder of the film. The film makes use of some typical horror film tactics: jump scares, chases by unseen and unnerving assailants (in this case, sphinxes), found-footage, poor lighting, and unexpected gruesome deaths, all on top of the typical labyrinth tropes: chambers filling with sand, collapsing floors, hidden passageways, and corridors that lead you back to where you started. Who are the Unfortunate Characters? Dr. Miles Holden, a professor from Princeton University, and his daughter Nora, head the excavation team. It consists of hundreds of Egyptian Guftis, who were hired to clear the sand from around the pyramid, and Michael Zahir, an Egyptian engineer in charge of robotics at the site (played by Amir Kamyab). The tension between the father-daughter team partly consists of their different preferences in archaeological methods: Nora likes to rely on satellite imagery, or “space archaeology,” to inform her decisions about the site, while her father complains that archaeology used to be about the “raw sensation” of excavating in the dirt. Rounding out the cast of characters are two documentary filmmakers, Sunni and Fitzie (played by Christa Nicola and James Buckley, respectively) conveniently on site for the new discovery and the team’s nightmarish descent into the pyramid. The film uses plenty of outdated stereotypes about ancient Egypt. In many books on ancient Egypt, we encounter the idea that tombs were protected with spells and curses, also trapdoors – a perfect horror trope that helps to reinforce the idea that when you go into a tomb, you’ll never come back out. The ‘archaeologists’ are introduced as Egypt-experts, yet they cannot really read the ancient texts. Unfortunately, the hieroglyphs throughout the interior of the pyramid are nonsense and the decor is a mishmash of styles from all periods of Egyptian history. As you’re watching, look out for the engaged statues of the pharaoh in the pyramid’s burial chamber that are obvious replicas of the statues from the Abu Simbel Temple interior. In one of the first rooms inside the pyramid, they notice a scene of rows of soldiers on one side of a door. While there are also some inscriptions, Dr. Holden looks at the rows of soldiers and interprets them as a warning – all without reading the hieroglyphs! On the other side of the door, a typical smiting scene is shown – the faces look cartoonish. We wondered, what element exactly led him to assuming it is a warning? Scenes of soldiers in Egyptian tombs are not uncommon, for example, at Beni Hasan. In another room, they notice a weighing of the heart scene, in which Osiris is shown in his seated position on the left with Anubis and Ammit by the scale. Osiris is interpreted as the king of the gods and the original king of Egypt – so far, so good. In the same room, the group notices a huge statue of Osiris in a false door niche, which turns out to be an actual false door. False doors in ancient Egypt are symbolic doorways that connect the realm of the living with that of the dead. These are located normally within a tomb and visitors would leave offerings to the deceased in front of them. In the film, however, Dr. Holden searches for a mechanism to operate the false door – clearly this is a modern contraption, not an ancient one! Perhaps the most frightful character is Anubis, who stands more than 2 m tall and is revealed to be a resident in the pyramid. In ancient Egyptian mythology, Anubis is an important funerary god who would take care of the mummification process and is often shown in weighing-of-the-heart scenes. 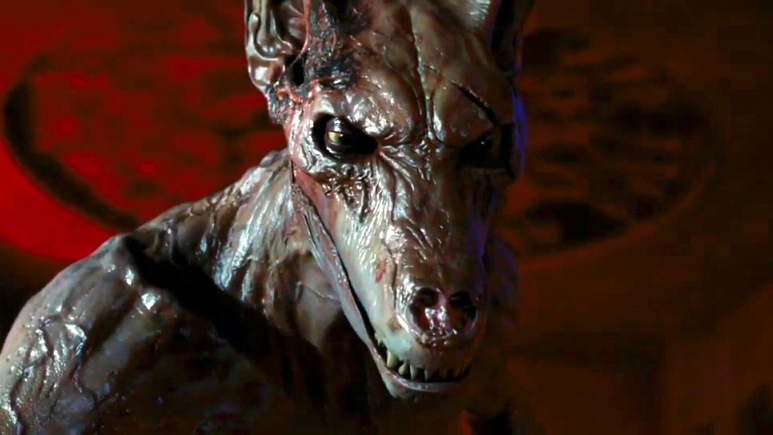 Reflecting most likely a hybrid of a jackal and a dog, the film-version gave the god a crocodile beak and gruesome features – perhaps to conflate him with Ammit, called “the devourer”, who is also frequently depicted in the weighing-of-the-heart scenes. Ammit bore the head of a crocodile, the body of a lion, and the hind parts of a hippopotamus – Anubis surely resembles Ammit in this film. Anubis, so we are told, is the one who eats the hearts of the deceased that fail to pass the judgment – that task, however, is normally reserved for Ammit. What was most intriguing was the life-size model of an actual scale, on which Anubis weighed real human hearts. We didn’t actually see a close-up of this scale to compare it to what we know, though it was frightening to see it in action! Needless to say, in this version of the weighing-of-the-heart, there is no happy afterlife that awaits the pure-hearted deceased. We really liked the idea of picking an Egyptianising film of the horror genre for Hallowe’en this year, but we didn’t know what to make of it after watching it. The amount of money that was available to the expedition, the huge number of workmen hired by the team, the advanced state of electronics available to them (their robot is on loan from NASA, and Nora Holden wears a video camera as her “notebook”) – these left us flabbergasted as individuals with real field experience in Egypt. Today’s archaeological excavations are expensive, but most teams hardly have a budget to accommodate such fancy equipment. It was definitely the scariest Egyptianising film we’ve ever seen! Happy Hallowe’en to all! What are you watching to celebrate? We’re glad you enjoyed it! Would be nice to have Egypt-themed celebrations for all seasons! I agree. This movie is really scary. Happy halloween! We were glad we decided to watch it during daylight hours! And to think that when we’ve entered pyramids in the past, we’ve only been on the lookout for snakes!